William Cordwin blades was originally born in 1852 at Spilsby. The 1861 census shows the 9 year old William living with his family at Normanby-by-Spital where his father was Innkeeper of the Cross Keys. By the 1871 census, the 19 year-old William was apprenticed to William Brown, a wheelwright in Ealand. In 1873 he married Sarah Kelsey whose family were boot makers. Not long after William set up his first business as a Coach Builder on Harvest Lane in Sheffield. Although apprenticed as a Wheelwright and joiner he was also a coachbuilder building drays and carts as he following adverts show. 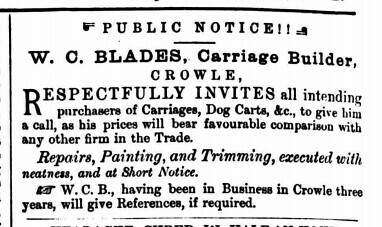 After being declared bankrupt in 1877 it appears he returned to Crowle where, by 1879, he had set up in business on the High Street, near Printing Office Lane. Despite being declared bankrupt again in 1894, coinciding with the death of his first Wife, he appears to have remained in business. He remarried in 1895, marrying Betsy Kettlewell, who was born in Derrythorpe, though had been working as a dressmaker and living on Cross Street. In 1898 he sold up and moved to Shadwell in London, where he is described as a Foreman Wheelwright. His later years were spent as a wheelwright in Sunninghill in Berkshire, where he died in 1925. Hi, I’m a fam hist fanatic. My ancestor connection is via Sarah Kelsey. I got most of my info from the Kelsey website. A brilliant site if you want to trace the Kelsey side. They have Wm Cordwin Blades at 204 High St, Shadwell, Middlesex in 1901 Wheelwright Foreman. but that’s the only info I have apart from the 1881 census in Crowle. Can’t find his marr to Sarah etc though I’m limited to just trolling the free familysearch site at the mo ’til I can get to a library and use ancestry or findmypast. Would like to keep in touch and swap findings if possible.